What impacts has computational thinking had on people and society? Sandwich High School students will have the opportunity to ponder this question as we will be offering Advanced Placement Computer Science Principles next year! The course is a new offering approved by the College Board. We are adding this exciting course to our Academic Opportunity Program of Studies! The course will focus on using technology and programming as a means to solve computational problems and create exciting and personally relevant artifacts. Students will design and implement innovative solutions using an iterative process similar to what artists, writers, computer scientists and engineers use to bring ideas to life. The course will focus on 7 big ideas which are foundational to studying computer science. They are creativity, abstraction, data & information, algorithms, programming, the internet and global impact. Each of these big ideas contains essential questions, enduring understandings which are tied to the learning objectives. For additional information about the course please visit the College Board Website. This past fall, many of the technology teachers had the opportunity to attend the Massachusetts Computer Using Educators annual fall conference and heard a keynote speech by Steve Vinter from Google. Steve is the site coordinator at the Google Campus in Cambridge. He shared alarming statistics about not having enough students study computer science in college to fill the millions of jobs that are needed. His key point was the need to pique students interest in computer science earlier. Currently we offer introduction to programming, advanced programming, game design and development, introduction to web design, and advanced web design. Adding an Advanced Placement course to compliment these courses is a natural next step. Mary Kelly has been participating in training with a group of 30 educators across the country which is sponsored and supported by Microsoft and Harvard University. 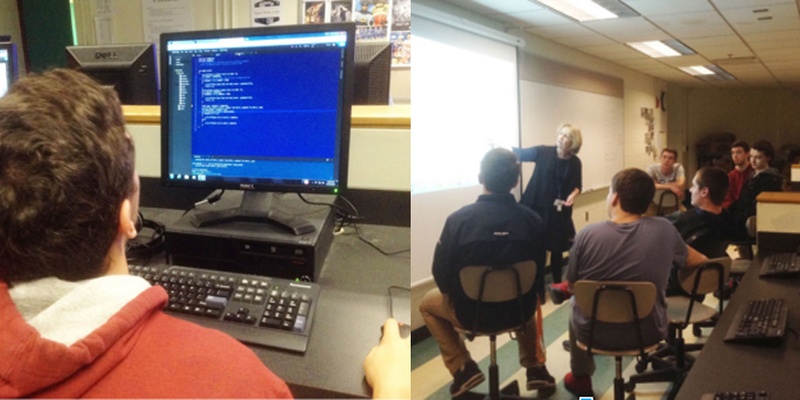 Again the goal is to bring the new computer science principles into high school classrooms and better prepare students by helping them gain Computer Science skills earlier. During this training educators all completed coursework over the summer and met in Cambridge for a four day workshop in August, specifically to prepare for the launch of a new AP Computer Science Principles course for Fall 2016. 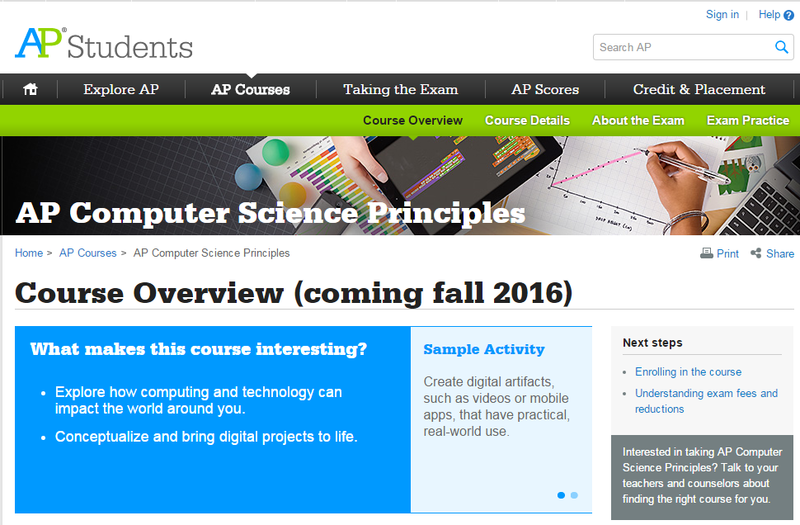 This new AP course is not language dependent, rather various computer languages are used and the focus is on applying critical thinking skills, understanding computer systems, and having a broad understanding of key computer science concepts (coding and applications that are the same but only vary in the language used). We are excited about this new opportunity for the students at Sandwich High School!